Surely, after Witch, Happy Birthday, and now King Tuff, one of Kyle Thomas’ projects will take hold and turn him into Sub Pop’s latest hot commodity. Lord knows they seem to release every single fart that this guy lets go of and they leave it to me to pin the tail on the moniker. King Tuff may be the first Kyle Thomas project that actually contributes to his billing as a scuzz rock royalty, as his self-titled sophomore effort seems to suggest. Suddenly, all of the concerns of his white underbelly schtick get overlooked under a barrage of memorable power chords and the occasional Bolan Boogie. He’s hinted at all of this before, but King Tuff actually overcomes all of the complaints that I had with Thomas’ Happy Birthday and with his catalog in general. With King Tuff, Thomas seems like he’s put in long hours working on nearly every aspect of the songs. From those aforementioned guitar highlights, to the intriguing lyrical perspective, and down to the scrapped together mix job which turned an abandoned school into what sounds like an inviting sonic Pepperland. “Someone told me long ago/Baby, just break the rules” he declares on “Baby Just Break,” and the press release for King Tuff likes to refer to that freak flag quite often. But King Tuff shows us that Thomas cleans up nicely, making the story of how he’s been living out of his shoes a bit more palatable and, more importantly, believable. This record sounds as though he’s putting forth a greater effort in getting out of his squatter motif, heading to a point where his music actually may provide enough bread to devote all of his energy into making more songs as memorable as he has here. “Hangin’ with my crew/At Loser’s Wall” tells the story of the social outcast’s turf, eerily mirroring my own reality growing up in a small Iowa river town. Cruising Main Street was the norm on Saturday night, but there was a spot called “The Wall” where the carless, the rideless, and sometimes the friendless would congregate. It was a cement wall in front of a shuttered Buick dealership where the weekend crew would sit, and the outcasts would endure the shouts of passersby, safe in their Daddy’s cars with some of the more cruel passengers armed with water balloons for added emphasis. Occasionally, a car would stop a pick someone up from the Wall, and they would suddenly be transformed from “losers” to people actually in motion. King Tuff is where Thomas catches a lift, but it’s good enough that he actually steers the vehicle somewhere beyond the endless asphalt circle. He drags us down to the “Swamp of Love,” deeper to the “Unusual World” and even past the old drive-in where the creature-feature infection of “Bad Thing” blasts like a bit of transistor garage rock. 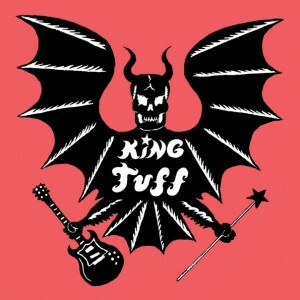 Ultimately, all of King Tuff represents some kind of sound from our past, but it maintains the optimism that most of us tend to lose by our early twenties. It is nice to be reminded of that forgotten optimism, and King Tuff provides it within its forty minutes, without irony, and without a hint of regret. None of it may be life-changing, but it’s certainly life-affirming, prompting King Tuff to be the first itchy chigger bite of this summer that you’ll want to keep scratching all season long. Then I dread to hear what his previous stuff sounds like.